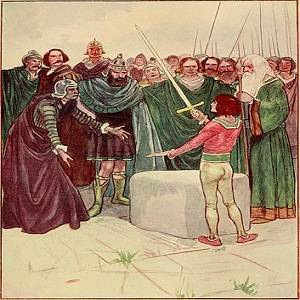 This is the Tale of The Sword in the Stone, a King Arthur Legend of the Sword Story. It is one of the many tales of King Arthur and the Knights of the Round Table. 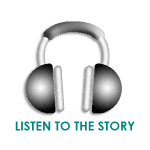 It is adapted and brought to you by Stories to Grow by. Long ago in England, a wise and just king ruled the land. His name was King Uther. Times were good and the people lived well. King Uther wanted a magician at court. And so he chose the famous Merlin the Magician. Merlin could see into the future. And he knew those good days were not going to last. Sadly, soon after the child’s birth the Queen died. Not long after, King Uther was killed in battle. That very night, Merlin swept into the castle and took the child. The next morning, the royal nurse went into the nursery. Alas, an empty crib! In fear, the nurse, the nobles and servants looked everywhere. But the baby was gone! For years, there was no king to sit on the throne. No king to set the laws. Men of high rank fought each other to be king. Darkness fell over the land. Robbers and bands of wild men ruled the streets of London. Evil men broke into houses and took what they wanted. Travelers on the roads were jumped and robbed. The people of England lived in fear. Yet far away, there was a quiet place. A good knight, Sir Ector, lived in peace with his two sons. His first son was named Kay. His younger son Arthur had been adopted as a baby. Years before, a stranger had come to Sir Ector with a baby. He asked if Sir Ector would raise the child. The old knight took the baby in his arms, glad for a second child. He named the baby Arthur, and raised the child as his own. Yet far away, there was a quiet place. When Arthur was ten years old, the same stranger returned to Sir Ector’s home. He could read and write, and so Sir Ector hired him to teach his two sons. Kay could not sit still for lessons and he stopped coming. But Arthur listened with wide eyes. He learned everything. I bet you have guessed by now who that stranger was – none other than Merlin the Magician! At the end of each day when Arthur finished his chores, that was time for the lessons. Merlin would sit with Arthur for hours and teach him about the world. Arthur was a thin lad, not strong like his big brother Kay. Merlin said not to worry about that. He said what mattered most was to have a heart that was big and strong. Merlin saw how the foxes and deer followed Arthur. He could see that the boy had a very big and strong heart. By the time Arthur was 16, his brother Kay had become a knight. He was now called Sir Kay. Arthur loved nothing more than to serve his brother as a squire. He kept great care of his brother’s tunic and helmet, his spears and lances. Merlin saw how the foxes and deer followed Arthur. One day at lesson time, Merlin looked away. He stood up. “What is it?” said Arthur. That night, when the nighttime was at its most dark, Merlin the Magician came to London’s market square. He stood in the middle of the square. He held both his arms high. And pointed his wand to the stars. The next morning at dawn, people started to arrive at the market. There in front of them was something most odd. A block of white marble stood in the middle of the town square. Resting on the block was a giant stone the size of a very large rock. At the very top of the stone there was a golden sword handle and a few inches of the blade, shining in the sun. Yet – this was most odd – the rest of the blade was buried deep into the stone. None of this was there the day before! There, in front of them, was something most odd. As soon as the crowd knew about the message, men jumped up to that white marble block. One after another, they gave the sword a yank. Each tried and tried, but the sword stuck fast. It would not move. The people danced and cheered. At last there was something to feel happy about! News of the tournament traveled fast. From castle to village, to every far corner of the land. At last, word got to the far-away home of Sir Ector. Sir Kay heard the news when he was polishing his helmet. “Arthur!” he called out. Arthur was by the woods, feeding birds from his hand. He set down a pile of seeds for the birds, and a pile for the squirrels. Then he ran fast to see his brother. What great news! Arthur had never been more than a few miles from home. He would be the best squire ever for his brother! Arthur ran back to the house. In the courtyard his father was getting the horses ready. Sir Ector and his two sons rode through London on their way to the tournament. Riding through the market square, something shiny glinted in the sun. “That sword looks like it goes right into that stone,” said Arthur. “But how can that be? That’s impossible.” But why were guards standing all around it? The father and his two sons reached the tournament. Sir Kay ran off to get in line to register. Sir Ector greeted many old friends – dukes, earls, barons, counts and countesses. Arthur sat in their tent, polishing his brother’s helmet till it shone bright. “Be quick about it!” said Kay. Kay’s spear, battle-axe, and dagger were where they should be. But no sword. Arthur ran back into the tent. Maybe he had left Kay’s sword there? He searched through the bag of armor and weapons. How could he let such a thing happen? Then he had an idea. Very fast, Arthur rode back to the market square. The guards were not there anymore – they must have all gone to the tournament. With one big tug, the sword slid out. Arthur was thrown back, but the sword was safe in his hands. “I will be sure to bring it right back.” He raced to the where his brother was waiting. “Here it is,” he said, handing the sword to his brother. Kay took one look. “Oh!” he said in surprise. “What is it?” said Arthur. But his brother was gone. Soon after, he heard his brother’s voice outside the tent. “Father, I have something to show you.” Kay and his father stepped inside the tent. “Look!” said Kay. He pointed to the sword. The young knight’s head dropped down. “You must take us to where you found this sword. At once!” The three of them rushed over to the market square. “Hey,” said Sir Kay. “I still need a sword!” He jumped up onto the marble block. Grabbing the hilt of the sword, he pulled and pulled. But it did not move. “You must have done something!” yelled Sir Kay. But it was too late. A crowd had already started to form. “Hey! Did you pull that sword out of the stone?” called one. “Do it again!” called another from the crowd. “Say! Did you pull the sword out of that stone?” called one. Arthur put his hands around the golden handle. With one tug, the blade slid out. “Go ahead. Put it back, son,” said a voice. It was the Duke of Cornwall, the one who had called for the tournament. “All right,” said Arthur. He slipped the blade back into the stone, with ease. “Let me at that now!” said the tall knight. He jumped up and grabbed the handle of the sword. But pull and tug as he might, the sword would not move. Not even a bit. Another knight tried. Then another. But no one could move the sword. Some waited, thinking the longer they pulled the sword, the looser it would get. But when each man took their turn, the sword did not move for them. Arthur stepped up to the stone again. In one motion he freed the sword. This time, he held it high above his head. The blade flashed in the sun. Amazed, the crowd did not know what to think. In one motion he freed the sword. “Yes!” said a voice. All eyes turned around. It was Merlin the Magician. A hush fell on the crowd. Cheers began to ring out. “Hail, King Arthur!” called someone from the crowd. “Hail, King Arthur!” called a voice. Sir Ector fell to his knees. Then Sir Kay. One person after another fell to their knees, too. All cheered. At last, a king had been chosen. A fresh young king, and a new day for England! Why did Merlin the Magician say Arthur had a heart that was big and strong? Why did it matter? Arthur was surprised he was made king. Tell about a time when something very good happened to you that you were not expecting. What do you think the story was trying to show you?